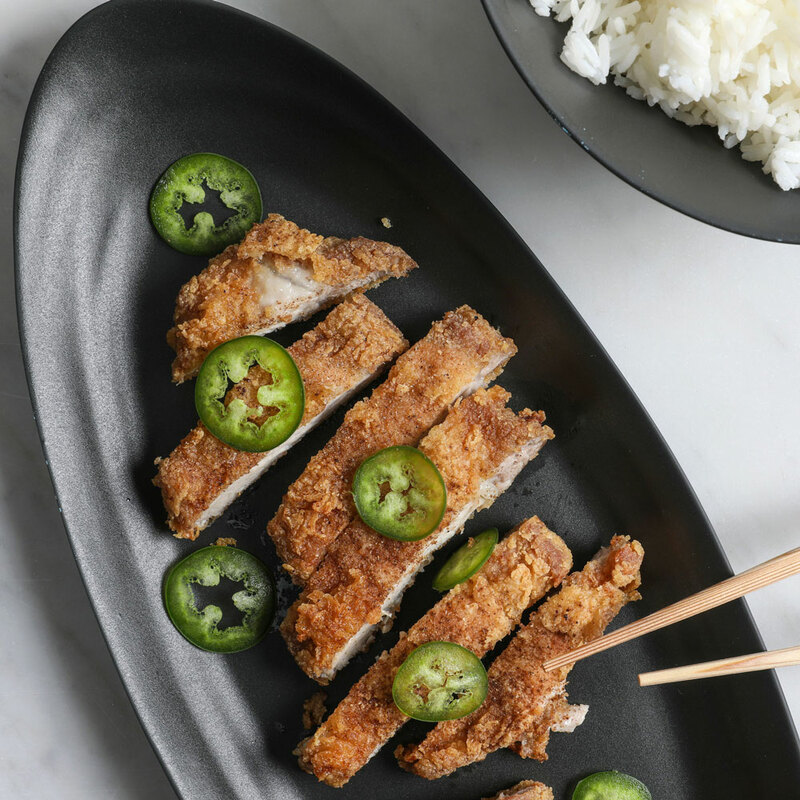 Wilson Tang’s cornstarch-battered pork chops are somehow crisp and nicely chewy at the same time. The Chinese five-spice powder and white pepper sprinkled on the chops after frying are like a touch of fairy dust. In a large bowl, beat the egg with 2 cups of water, 1/4 cup of the cornstarch, the potato starch, 1 tablespoon of salt, the baking soda, and the 11/2 tablespoons of canola oil. Add the pork, and turn to coat. Cover and refrigerate for at least 2 hours or overnight. In a large saucepan, heat 3 inches of canola oil to 350°. Spread the remaining 1 cup of cornstarch in a shallow bowl. Remove 2 of the pork chops from the batter, letting the excess batter drip back into the bowl, then dredge in the cornstarch. Add the coated pork to the hot oil, and fry until golden and crisp, 3 to 5 minutes. Transfer to paper towels to drain. Dust with five-spice powder and white pepper, and season with salt. Repeat with the remaining 2 pork chops. Transfer the pork chops to a carving board and cut into strips. Transfer to plates or a platter, top with jalapeño, and serve with white rice.